If you’ve ever questioned whether vegan cheesecake could be as good as the real thing, we have your answer. Absolutely yes. 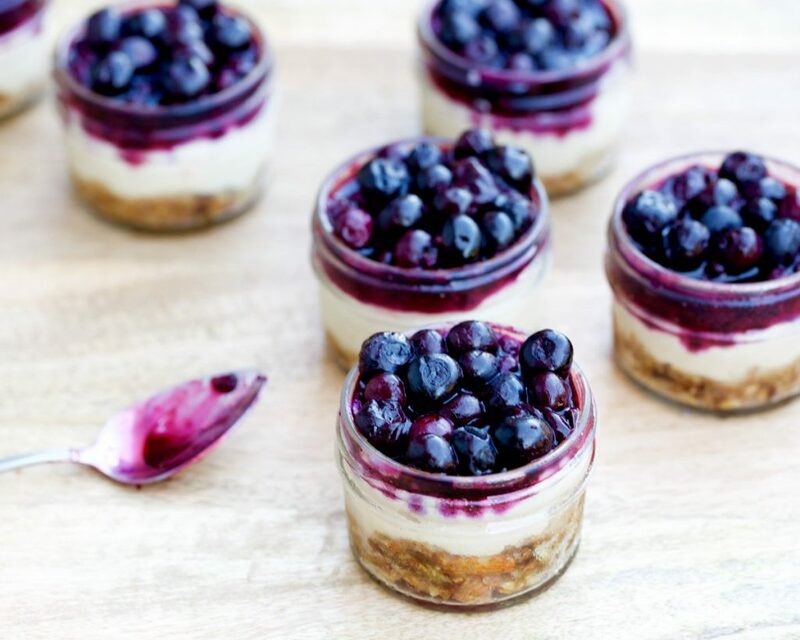 These Bite-Sized Vegan Blueberry Cheesecakes are perfectly creamy. They literally melt in your mouth with every (subtly sweet) bite. We mean it. We almost finished eating the recipe before we concluded filming it — which would have been all bad. The best part about this recipe isn’t how incredibly delicious it tastes. It’s the cute 4-ounce single serve mason jars we prepared it in. This makes it easy to know how much one serving is. They are great to bring to a potluck. Or party. Or to hoard them all in your freezer and have one serving after dinner everyday for a week… like we did. In case you missed it, this year we became official spokespeople for the U.S. Highbush Blueberry Council. 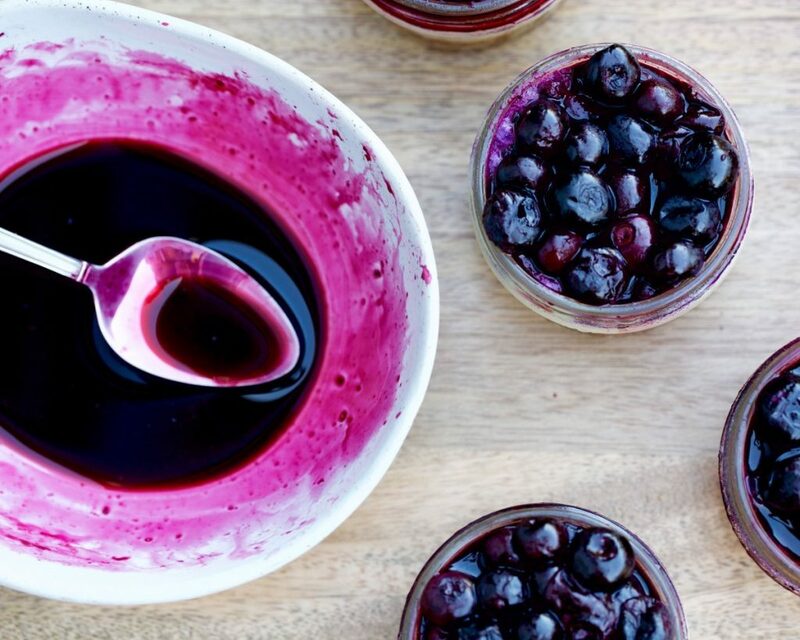 As part of the “Blue Crew,” we will be developing a 6-part series of healthy blueberry recipes that are literally knock-your-socks-off delicious. Each recipe will also be in video format, which means you should subscribe to our Youtube channel, if you haven’t already. Last month, we kicked this series off with this Warm Cozy Blueberry Crumble Recipe, which is equally incredible. 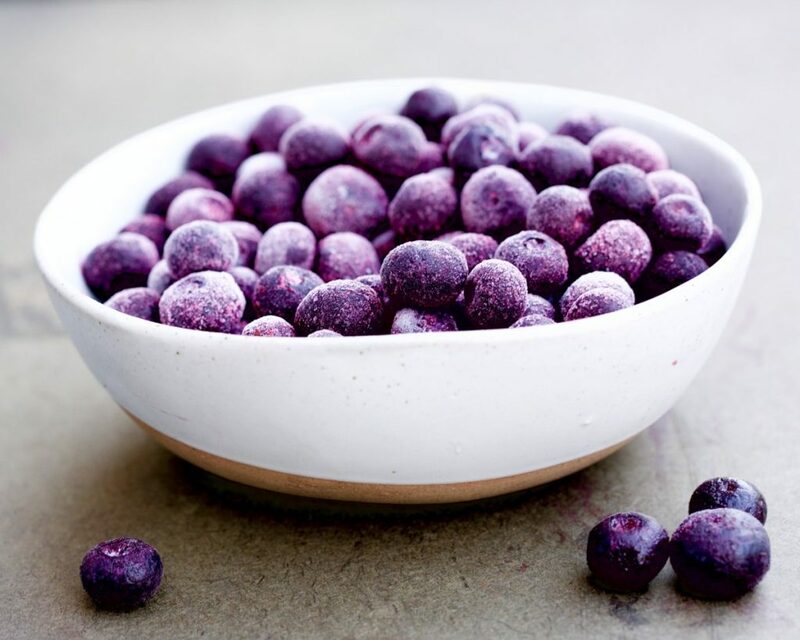 We love blueberries because they are a nutrition powerhouse. One cup of packs almost 4 grams of fiber (which helps you feel full and satisfied) and just 80 calories. A single serving also delivers about 25% of your vitamin C needs for the day, which studies suggest may help to strengthen your immunity. Before getting started, remove 3 medium-sized bowls from the cabinets. You’ll use one for the crust, one for the cheese and one for the blueberries. Let’s start with the crust. The first thing you need to do is pulse the almonds and dates in a food processor until you achieve a crust like consistency. Remove from the processor and transfer to a bowl. Set aside. For the cheese, blend cashews with water, coconut cream, coconut oil and lemon until you have a smooth, creamy consistency. For the blueberry topping, heat frozen blueberries, lemon juice, and brown sugar in the microwave for 2 minutes. This part smells amazing. Lastly, you’ll want to lay out all 6 mason jars and start by dividing the crust into each jar. Next add a layer of cream cheese and then a final layer of blueberry topping. Stir on the lids and place in the freezer or fridge to let them firm up for at least 2 hours before serving. Store the remaining treats in the freezer until ready to enjoy! 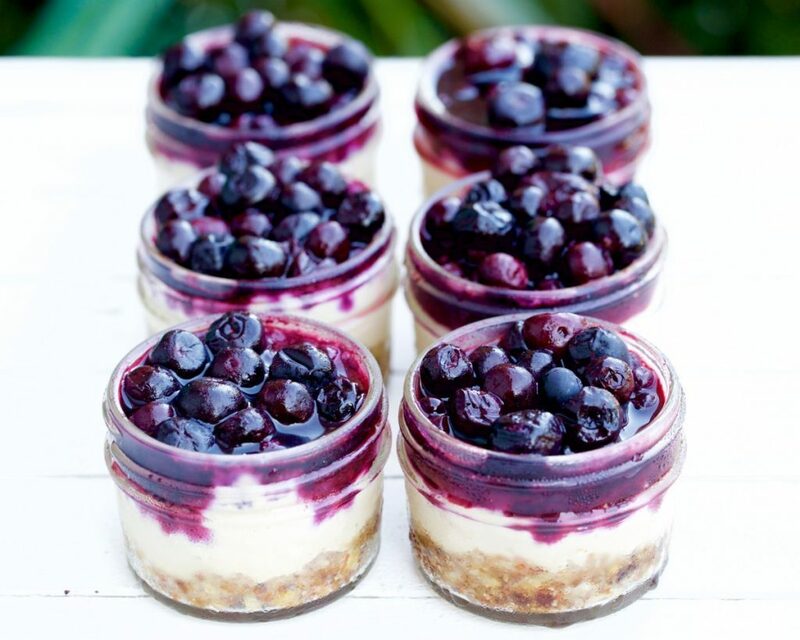 When that time comes, just let these Bite-Sized Vegan Blueberry Cheesecakes defrost at room temperature, and then dig in! Before getting started, remove 3 medium-sized bowls from the cabinets. You’ll use one for the crust, one for the cheese and one for the blueberries. For the crust, pulse almonds and dates in a food processor until you achieve a crust like consistency. Remove from processor and transfer to a bowl. Set aside. Lay out all 6 mason jars and start by dividing the crust in each jar. Next add a layer of cream cheese and then a final layer of blueberry topping. Stir on the lids and place in the fridge for at least 2 hours to let them firm up before serving. Store the remaining treats in the freezer until ready to enjoy. When that time comes, just let them defrost at room temperature, and then dig in! What is the nutritional breakdown for this recipe. Calories, fat, sugar, protein etc. Are you kidding me??? As Registered Dietitians, you can’t find the time to enter the recipe into USDA Handbook #8 and divide by six??? I wonder how much time it took to write the blog and do the photo shoot??? I would serious reconsider your response to this request. No we don’t have the time, as we’re juggling recipe development, content creation, seeing patients, all the while trying to stay sane. We’re not advocates of calorie counting/macros counting, and don’t see it as a pre-requisite for healthful eating. You can go ahead and do those calculations and decide whether or not this recipe is right for you. Yum- this was so good! I made it last week for my boyfriend who is lactose intolerant and we both loved it! Those little jars didn’t last long in the fridge! It didn’t take that long to make either. The only thing I’ll change next time is I’ll use an imersion hand blender for the cashew cheese- my regular blender didn’t get it quite creamy enough. Ahh okay good suggestion. Food processors may work a bit better too! This looks awesome. How would I modify this to use fresh blueberries not frozen. Could you possibly use a blender instead of a food processor to make the crust?? Also just made your vegan sour cream and egg frittatas, they are both so so delicious! I used bell pepper and cilantro in my eggs 🙂 thanks so much for the great recipes!